Wow every other week seems like a lot, for me that would be after only 2 trips to the grocery store. I do agree I need to wash mine though but maybe every 2 months. I don't put raw meat in mine so I figure nothing horrid is growing in them? Yeah I guess twice a month seems like a lot. But in addition to going to the grocery store once a week I also use the bags at either the CSA or Farmer's market every weekend and in that case I am putting produce right in there. So I figure I better wash them a little more often. And I'll hang them out on the deck to dry. My hubby saw an article about this almost a year ago...he called me totally freaked out. I told him, "Why do you think I have TWO sets of Envirosax? I wash them all the time." 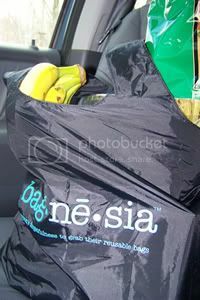 That's the cool thing about those bags you use (the bagnesia ones)- you picked a washable bag so you can just throw it in the laundry with your other stuff and then hang it up to dry in a few minutes!